As a company, have you ever considered outsourcing your payroll services? Did you know a majority of companies hire another company to take care of all of their payroll services? At Journey Business Solution, we pride ourselves on being a company that helps small and startup businesses with merchant and payroll services. We’ve seen many companies who have decided to outsource their services for many different reasons. If you’ve been considering outsourcing for your own services, then this blog can give you the big picture of why it’s so beneficial to outsource your payroll services. You might think it’s easier to keep it in-house, but with these reasons, you’ll notice that companies who do outsource their payroll have a lot more opportunities than ones that don’t. There are a few reasons behind why it can be essential for a company to outsource their services. When you’re a business, don’t you want to concentrate on growing and making sure your business is functioning fluidly? The first and foremost reason behind why you should outsource is because it saves your company time and money. You might be thinking: How can hiring a new business help with saving money for my company? When you hire a payroll service, they are able to follow the appropriate guidelines as opposed to a startup company that might be having difficulties with figuring out payroll. 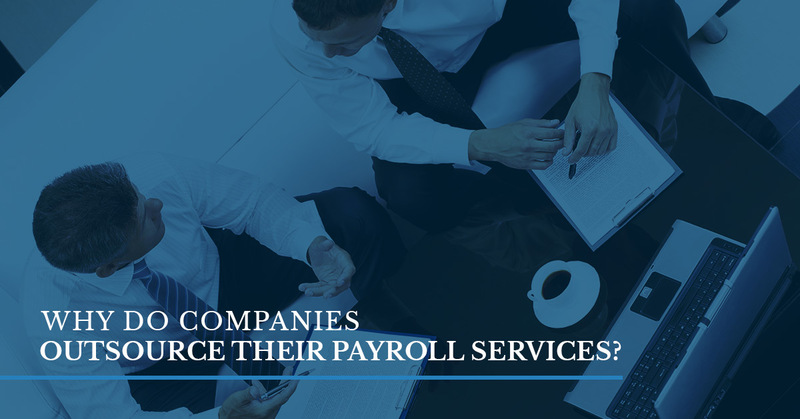 Hiring a payroll company will eliminate your need to prepare the correct paperwork, any fees that might need to be processed due to filling out incorrect paperwork, and it allows you to save time and money. Lastly, a payroll company will have security that’s difficult to infiltrate. With a company who has in-house payroll, they may not have the correct security to keep everyone’s information private and safe. When you outsource your payroll services, you’ll be able to free up your time to cater to your company. As we mentioned above with reasons why people outsource, it’s a benefit to actually have the time to work on your company and make it flourish. Additionally, another benefit for outsourcing payroll services is the company you go to will have a lot more options than you would be able to offer. For instance, a lot of people enjoy direct deposit and when you’re a company that offers services for payroll, you’ll be able to give your workers the ability to have direct deposit and other options that are impossible to get through your company. Avoid fees, headaches, and penalties, when you decide to outsource your payroll services. Increase the time you spend on your company, the money you make, and the options you have available to your employees to make you a company people want to come work for. Journey Business Solutions can offer you an alternative to in-house payroll with our services. When a business decides to outsource their company, they can take advantage of the simple fact that they have more time to concentrate on their company. Let us figure out all of the payroll services while you allow your business to flourish. For any questions you may have about our services, don’t hesitate to contact us. We cater to the Dallas, Fort Worth, and RGV area.